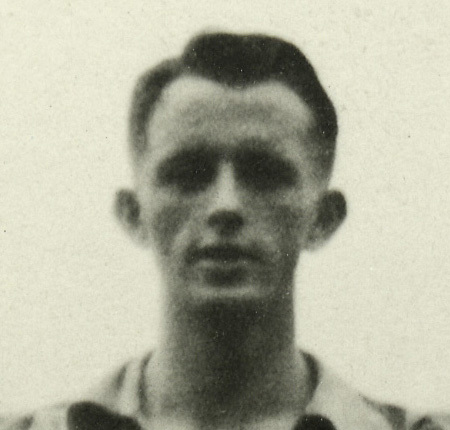 John Dutchman was a forward who played for Leeds United in the run up to the war before being called up to the RAF, where he trained as a bomb aimer in South Africa. Following the war, teacher training brought him to Jordanhill College, and for a couple of months in the 1949/50 season he played seven games for Queen's scoring three times. After Queen's , he was a member of the 1951 Pegasus side that won the F.A. Amateur Cup against Bishop Auckland at Wembley in front of a six figure crowd. Following this, he played for Corinthian Casuals, where he won an an English Amateur international cap, before moving to Walthamstow Avenue. Outside of football, Dutchman was Head of Geography at Chigwell, and he died on 22 June 2014, age 88.